From grade school to college, we can get you there! 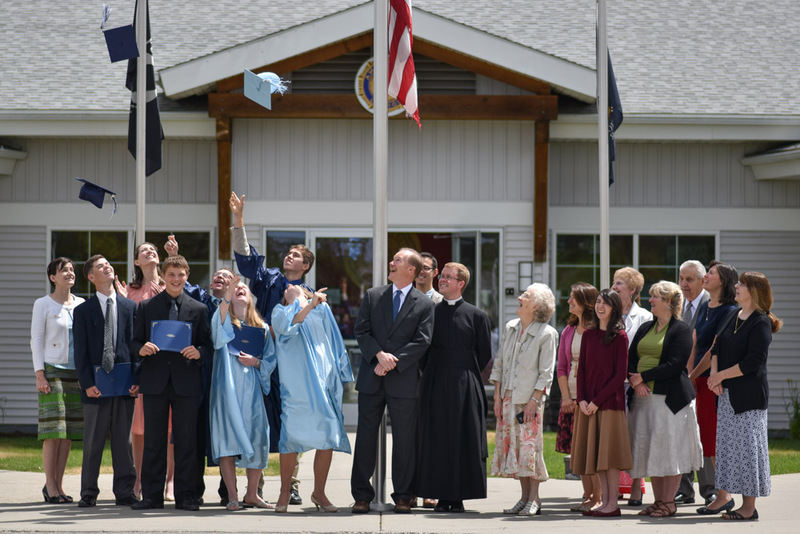 of traditional Catholic education we’ve helped over 25,000 students reach their full potential, many of them choosing to pursue a higher education. This option includes purchasing the lesson plans and quarter tests (assigned books can be purchased separately). However, unlike full enrollment, the student’s work or assignments will not be sent to our tutors and instead the test answer keys will be included. Parent will be responsible for correcting all assignments, issuing all grades and keeping all records.however, unlike full enrollment, the student’s work or assignments will not be sent to our tutors and instead the test answer keys will be included. Parent will be responsible for correcting all assignments, issuing all grades and keeping all records. All courses in 7th through 12th grade are available for single course enrollment. Select courses are available for Kindergarten through 6th grade. This option includes record keeping, issuing quarterly progress reports, report cards, tutor support, academic counselor support, and lesson plans. Our lesson plans detail a 36 week school year. Please call for course availability. See Bookstore for school book pricing. Before proceeding with Enrollment, please contact us by phone or email to discuss the proper placement of your student. Standard Transfer – If a student has completed their school year, transcripts are not necessary but highly recommended for academic placement purposes. Mid-yearTransfer – Transcripts from the student’s previous school enrollment must be submitted for academic placement purposes. Standard Transfer – All students wishing to transfer into Our Lady of Victory at any point past 9th grade are required to submit transcripts to assure that the high school courses completed at another institution will fulfill the requirements of our distinguished Catholic curriculum. Mid-year Transfer – Same as above. No Transcripts – When a high school student has no official transcripts to submit and wishes to transfer into Our Lady of Victory School, the steps outlined in the Unofficial Transcript Guidelines Form must be completed and submitted along with a payment of $75. The School Administration will review the submitted records and contact you within two weeks. Children are usually ready and eager to learn at approximately 4 ½ – 5 ½ years of age. Not to give them a real learning opportunity leads only to frustration on their part. Based on scientific evidence concerning the development of the nervous system, most children should possess the fine motor skills required for cursive handwriting by the end of the Kindergarten year. Therefore our Kindergarten curriculum features a normal selection of studies in religion, reading, phonics, math and science, along with supplemental work in art, writing and music. The courses move slowly so that the student has the opportunity to adjust to the program; adaptations can also be made in order to fit varying maturity levels. Religion: The teacher introduces this subject using Chats with God’s Little Ones, a catechetical text adapted for short informal discussions with the child. It includes related art projects and semester evaluation tests. A second text, Leading the Little Ones to Mary, will also help explain the Faith. The Bible and rosary will be introduced through the New Catholic Picture Bible, read aloud by the teacher, and the Pray the Rosary booklet. Arithmetic: Students will begin with number identification and counting to 100 before progressing to single digit addition, subtraction up to 6, and telling time. Books used: Arithmetic Instruction Manual, Drill Test& Review Pages K, & Counting Workbook. Phonics & Reading: Using Spectrum Phonics K and the Little Angel A series in tandem, the teachers will begin introducing phonics and reading to their students simultaneously. The Little Angel Reader A, and its accompanying workbook act as the focal point of the program, with teacher guidance found in the Little Angel A Teachers’ Manual. Handwriting: Students begin their writing practice with manuscript using the workbook, Writing Capital and Small Letters, as they learn to print. In the fourth quarter, they will transition to easy cursive exercises in Catholic Writing Skills K so that they will be prepared to follow the rest of our cursive handwriting program through middle school. Science: Science at this level should consist of the introduction of very basic concepts, both to help students learn to enjoy the subject and to learn to see traces of the Creator reflected in creation. Accordingly, the Science & Living in God’s World K workbook presents simple facts about human beings, weather, seasons, seeds, animals, and recreational environments. Art: The students’ artwork will consist of five coloring books, as well as art assignments from Chats with God’s Little Ones, which support the ideas discussed in the religion lessons. The coloring books are: Catholic I 23 Coloring Book, Angels Coloring Book, Catholic ABC Coloring Book, Jesus Our Savior Book 1 Coloring Book, and Our Mother Mary Coloring Book. Teachers may reduce the amount of coloring assigned if they feel the student is becoming overwhelmed. 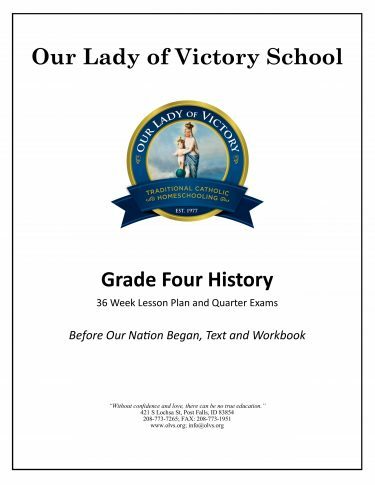 Music: In an effort to preserve the tradition of singing patriotic, folk and Catholic hymns and songs, students will be encouraged to learn the lyrics and tunes of several pieces by listening to the CD, Songs for God and Country, while reading along in the accompanying songbook. Homework: Extra practice for phonics and arithmetic will be assigned in the Seatwork Book. This year’s studies will further the learning skills developed in Kindergarten. The OLVS Grade 1 program is meant for children aged SY, – 6. Children without prior schooling should complete the OLVS Kindergarten year before entering Grade 1. They are welcome to work at an accelerated pace until they are ready to start Grade 1, but they will need the Kindergarten foundation before beginning grade school. Religion: Grade 1 sees the beginning of the Living My Religion series, a traditional catechism program reproduced from the 1940’s, based on the Baltimore Catechism. Living in God’s Love is the first text in the series and ensures that the pupil has a clear and age-appropriate grasp of the Faith, reinforced by exercises in an accompanying workbook. Seven readers support the lessons learned: Miniature Stories of the Saints (Set of 4), God Loves Us All, Good St. Joseph, and The Miracles of Jesus. The student also learns the Stabat Mater in English using the Way of the Cross booklet. Arithmetic: The year begins with a review of the math basics covered in Kindergarten followed by advances in addition and subtraction, with the goal of bringing students to work with double digits and story problems. Textbooks include Lepanto Math Level 1 Workbook and Drill Test & Review Pages 1. For the teachers’ use are Lepanto Math Level 1Answer Key and Arithmetic Instruction Manual. Phonics & Reading: Students will continue to learn phonics letter sounds while developing reading and vocabulary. In Little Angel Readers B & C, the students learn letter-sound relationships systematically, beginning with the easiest. Stories with phonetically-controlled vocabulary follow word drills. Little Angel B & C Workbooks and Spectrum Phonics 1 reinforce lessons from the readers with exercises in phonics, vocabulary, and reading comprehension. Progress Tests in the Little Angel B & C Teacher’s Manuals assess mastery of skills after each review. Students will practice their reading with the Catholic National Reader New Primer & Book One, as well as several religious chapter books from Fr. Lovasik. Spelling: Grade I introduces spelling into the core curriculum, using Traditional Catholic Speller 1. The student will learn nearly 300 new words, a portion of which are drawn from their catechism lessons. Handwriting: After reviewing the basic strokes and lower-case letters from Kindergarten, students will continue practicing capital letters and entire words throughout the year. Science: This year’s workbook, Science & Living in God’s World 1, presents the fascinating story of creation and God’s care for it. Children find the other text, Seaside & Wayside Book 1, a delightful study of various sea creatures. Grammar: Lepanto Grammar 1 & 2 introduce basic grammar and writing skills, including parts of speech, punctuation, capitalization and sentence The teachers’ manual reinforces the workbook exercises and contains additional oral exercises. History: A coloring workbook, America My Country, presents simple facts about the United States’ flag and founders, Native American, Pilgrims, pioneers, and other basics of the country’s early history. Art: The students’ artwork consists of five coloring books, which support the various subjects discussed in religion: 24 Catholic Songs Coloring Book, Holy Name of Jesus Coloring Book, Stations of the Cross Coloring Book, Ten Commandments Coloring Book, Jesus Our Savior Book 2 Coloring Book. Music: Continuing from Kindergarten, students will be encouraged to learn the lyrics and tunes of several religious, folk and patriotic pieces by listening to the CD, Songs for God and Country, while reading along in the accompanying songbook. This year’s study will refine the concepts learned in Grades K and 1. Emphasis will be placed on teaching the students to be able and willing to apply traditional Catholic ideals to their academic endeavors and everyday lives. Religion: Grade 2 continues the Living My Religion series with Living in God’s Law. 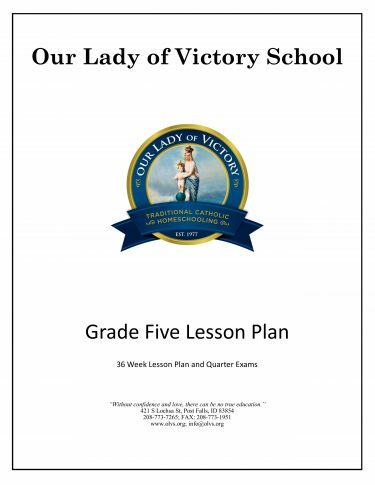 Students will become more familiar with the Bible and Our Lady through use of the New Catholic Picture Bible and Leading the Little Ones to Mary. Since this is often the age for reception of First Holy Communion, the student will also specially study the St. Joseph First Communion Catechism in the 2″d semester. Two Fr. Lovasik readers, Seven Sacraments and Ten Commandments, emphasize the lessons learned in the First Communion preparation. Arithmetic: This year will add new skills to the students’ math concepts, including 3-digit addition and subtraction, simple multiplication and division, time, measurements, word problems, and much more. Students will work in Lepanto Math 2 Workbook and Review & Worksheets (Gr. 2). Phonics: As in previous years, phonics will be the basis for word skills in reading. Students will continue to learn proficiency with the various phonemes while developing their vocabulary. Using Little Angel Reader D, students will practice decoding words containing the more difficult phonemes. Stories with phonetically-controlled vocabulary follow each word drill. Little Angel D Workbook and Spectrum Phonics 2 reinforce lessons with exercises in phonics, vocabulary, and reading comprehension. Progress Tests in Little Angel D Teacher’s Manual will assess students’ mastery of skills. Reading: The students will practice and develop their reading skills with the Catholic National Reader 2, along with several Fr. Lovasik chapter books: Mary My Mother, St. Peter the Apostle, Blessed Kateri Tekakwitha, Stations of the Cross; Angels. Grammar & Spelling: The students will use the God Gave Me the Gift of Language 2 Workbook to solidify basic grammar concepts such as complete sentences, capitalization, punctuation, suffixes and prefixes, syllabification, alphabetization, and much more. In Traditional Catholic Speller 2, they will learn to spell 680 new words, including Catholic terms. Handwriting: Students will continue to practice their penmanship in Catholic Writing Skills 2, using a slightly reduced size as they work toward legible, normal-sized handwriting. Science: This year’s course will cover the plant world, insects, rocks and soil, the sun, and various means of transportation, all through study of Science and Living in God’s World 2. Additionally, students will broaden their knowledge of animals by reading Animal Life. with social studies and map-reading instruction. Art: The students’ artwork will consist of four coloring books: Our Lady of La Salette Coloring Book, Eucharistic Adoration Coloring Book, Come to Mass Coloring Book, Let’s Follow Jesus Coloring Book. 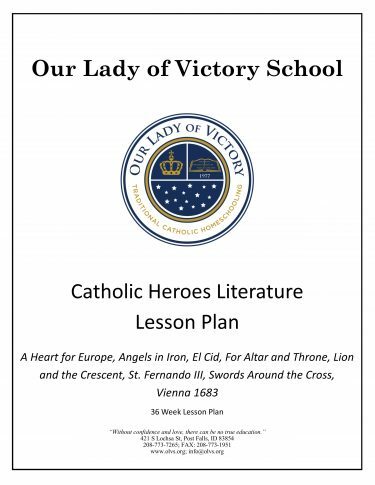 Music: Continuing the tradition of singing patriotic, folk and Catholic hymns and songs, students will learn the lyrics and tunes of several more pieces by listening to the CD, Song for God and Country, while reading along in the accompanying songbook. Students will complete the process of solidifying the primary skills learned in school thus far. The year is meant to tie up all loose ends from the primary years, with an emphasis on perfecting and focusing the core skills. The curriculum is also meant to prepare the children for the more involved topics and concepts which will be introduced in the middle elementary grades. Religion: Grade 3 continues the Living My Religion series with Living in God’s Grace, which aims to lead students to appreciate God’s grace so that they will always strive to live therein. Students will also read selections from the Picture Book of Saints and Book of Saints, Part I .
Arithmetic: This year, Lepanto Math Level 3 will cover new addition and subtraction facts, meanings of numbers to 10,000, Roman numerals, subtracting two digit numbers with borrowing, multiplication and division using numbers through eight, and many story problems. Reading: Since the students have mastered phonics rules, they will be encouraged to read a great deal more. Their main text will be the Catholic National Reader 3, accompanied by Our Lady of Fatima, Parables of Jesus, Promises of the Sacred Heart, St. Francis of Assisi, St. Paul the Apostle, Book of Saints Part 2-all by Fr. Lovasik-as well as the Catholic fable collection, Just Stories. The coloring books, Saints of the Eucharist, More Saints of the Eucharist, and Mother of God Coloring Book, with reading pages beside each illustration page, are also assigned. They will be tested for comprehension of subject matter. Grammar, Spelling, Handwriting: Using God Gave Me the Gift of Language 3, students will study and practice further grammar concepts including the rules for sentences, capitalization, punctuation, number, synonyms, antonyms, letter writing, dictionary use, and parts of speech. Spelling and related exercises will be assigned each week in Traditional Catholic Speller 3. The students will practice penmanship with Writing in Cursive Hand 3, which is set up to be used in tandem with the speller. History: In How Our Nation Began, students will encounter a basic survey of the discovery and settling of the New World, followed by the colonies’ growth into a new nation. The textbook is accompanied and supplemented by a workbook with exercises, map work, and review pages. Science: This year’s science course, presented in Science & Living in God’s World 3, will cover topics such as designing and building a home, helping with the garden, establishing an aquarium, experimenting with electricity, studying the moon, enjoying life in the spring, learning how objects work, and visiting a state park. Students will complete a quiz booklet covering the material, and will also read from Seaside and Wayside, Book 3. Art: Besides completing two coloring books- 7 Sacraments and Works of Mercy Coloring Book and St. Frances Cabrini Coloring Book-students will also study from Art-Lit Reader, Primer & Book One, which will introduce them to many famous works of art and poetry. Music: In an effort to preserve the tradition of singing patriotic, folk and Catholic hymns and songs, students will be encouraged to learn the words and tunes of several pieces by listening to the CD, Songs for God and Country, while reading along in the accompanying songbook. This year’s studies will expose students to concepts requiring higher level cognitive thinking and reasoning. This will begin a more advanced scholarship, whereby children no longer simply memorize information, but understand ideas more deeply. They will apply knowledge and begin to work in the abstract and theoretical realms while fine-tuning their study habits. Religion: Grade 4 continues the Living My Religion series with Living for God. As an accompaniment, the teachers can read Sunday Morning Story/and: Sermon for the Children’s Mass by Rev. Wilfred J. Diamond to their students. The book contains a story to complement the Gospel for each Sunday of the liturgical year. Arithmetic: This year begins the students’ work in the Saxon Math series. Saxon 54 leads off the mid­ elementary sequence. Under the Saxon plan, the students study math using the incremental method, with previously studied and mastered skills interspersed among new concepts in subsequent lessons. Saxon labels its program as integrated, which means that it includes varied content, such as basic number concepts, estimation, functions, two and three digit computations, geometry and even algebra. Saxon has found that the continual and incremental practice provides the opportunity for students to learn and remember the foundational skills and concepts of mathematics. Reading: All of our students are encouraged to read a great deal, not only in conjunction with the curriculum, but for enjoyment and expansion of their horizons. Experience has shown that avid readers make the best students in general, and the most articulate writers, in particular. We also encourage children to read as many books of a religious nature as they can, and thus assign St. Thomas Aquinas and Little Therese. The student will also peruse selections from Catholic National Reader 4 and Art-Lit Reader Book Two. Grammar & Spelling: This year sees the start of the Lepanto Grammar series, with Lepanto Grammar 4, the accompanying teacher’s manual, and a workbook of grammar exercises. The lesson plan arranges the assignments from the textbook to match those in the workbook, ensuring that grammatical concepts are covered concurrently. The student will also learn hundreds of new words in Traditional Catholic Speller 4, with words and activities assigned each week. Handwriting: Students will continue to practice their penmanship by taking spelling tests and copying quotations from famous authors in Catholic Writing Skills 4. Science: This year Science and Living in God’s World 4 continues with a more in-depth look at the earth, living creatures, our bodies, and natural resources. A workbook of quizzes helps impress the information upon the children’s memories. Geography: Students will study geography from My World of Neighbors, a 1965 Catholic school textbook, updated with current information on countries and cities, as well as new sections on Australia and New Zealand. Students will take a trip across the United States from New York to Hawaii, stopping in California to color in Missions of California Coloring Book, then travel around the world. A workbook is available and very helpful to the student, but not assigned in the lesson plans. This year’s studies builds upon the previous year’s practice in applying abstract ideas and learned concepts in practical situations and different circumstances. The reading program is also greatly expanded, as love of literature is one of the foundations of OLVS’s middle and high school programs. Religion: Grade 5 continues the Living My Religion series with Living Through God’s Gifts. The other focus of religion will be the old rite of the Mass, sometimes called the Tridentine Rite, the Traditional Latin Mass, or the Extraordinary Form. By studying The Holy Sacrifice of the Mass, students will learn the prayers and the best method of assisting at Mass, as well as details about the altar and priest’s vestments. The Picture Book of Saints will augment their knowledge of saints’ lives and church history. Arithmetic: Those students who successfully completed Saxon 54 will continue into Saxon 65. The content ranges from basic combinations to arithmetic with whole numbers, decimals, and fractions, and includes word problems, measurement, scale and graph reading. Reading: This year, the student’s development of good reading habits continues with the first half of Catholic National Reader 5, as well as three young adult novels and a saint’s biography with Blood Red Crescent, Blue Gonfalon, The Good Master, and Patron Saint of First Communicants. Grammar & Spelling: This year Lepanto Grammar 5 adopts the structure which will be used through Grade 8: the first half of the text is dedicated to compositional activities, while the latter half covers grammatical concepts. The former part emphasizes creative writing on a variety of topics and in diverse circumstances. The grammar section deals with different parts of speech, as well as sentences and punctuation, and is supported by the accompanying Lepanto Grammar 5 Workbook. Thanks to Traditional Catholic Speller 5, students will learn to spell and define hundreds of words, both of a religious and secular nature. Science: This year, Science & Living in God’s World 5 will concentrate on vertebrates and invertebrates, plants, the human body, weather forecasting, earth and space navigation, mechanical and heat energy, chemical and nuclear energy, electricity, prudent use of natural resources, and fossil records. This study will stress how God, as the Creator of all things, has designed our bodies as well as all matter around us in a wondrous way. The student will be tested on the material through the accompanying test booklet. 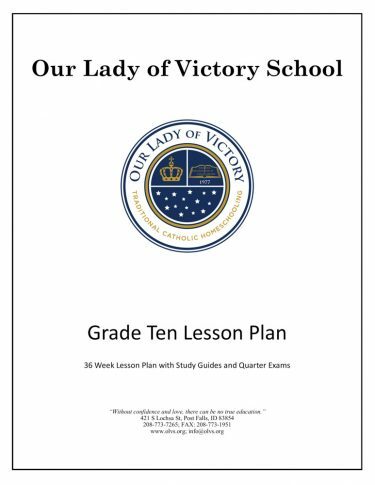 Handwriting: Students will continue to perfect their penmanship by taking spelling tests and copying quotations in Catholic Writing Skills 5. History: The students will study the Catholic perspective in American History, by Monsignor Goebel and Sister Mary Richardine. The time period covered runs from the discovery and exploration of America, through its colonization, independence, growth, division and reunification, to its emergence as a world power in the 20th Century. This year’s studies will round out the concepts learned in the middle grades, completing mastery of fundamental skills while directing the child to apply them to every subject area. To prepare the student for tackling the course content of Grades 7 and 8, more strenuous assignments will be introduced this year, particularly in Reading and Science. Additionally, now that students are expected to think on a more theoretical plane, they will be required to apply the tenets of their Faith throughout their studies. Religion: Grade 6 continues the Living My Religion series with Living in God’s Church. This is explained and correlated through Bible and Church history. The students will develop the good habit of daily reading of Butler’s Lives of the Saints, in which are many accounts of special feast days and saints’ lives. A special treat will be the reading of Heavens’ Treasures, an anthology of delightful stories of the Faith. Arithmetic: Students will advance to Saxon 76, practicing concepts such as fractions, decimals, percent, ratios, perimeter, circumference, area, volume, exponents, scientific notation, and signed numbers. Students continually practice problem-solving techniques through word problems, and reinforce concepts taught in previous lessons. Reading: Continuing from Grade 5, the students will complete Catholic National Reader 5 as the main part of their reading assignments in Grade 6. Art-Lit Reader Book Three will also expose them to art, poetry and prose by some of the world’s most highly respected artists and writers. Historical fiction selections include The Little Duke, Boy Knight of Rheims, and Where Valor Lies, and are supplemented by the story of the Children of Fatima. 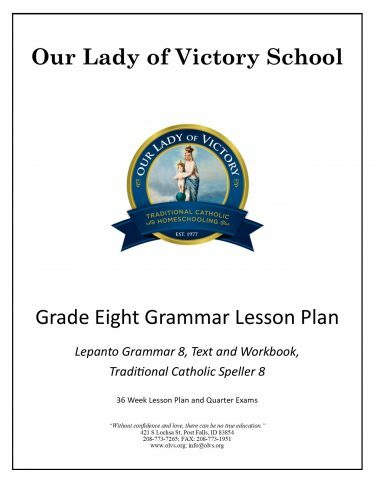 Grammar & Spelling: This year’s Lepanto Grammar 6 and the accompanying workbook will extend what was studied in Grade 5. Both the activities and grammar in the text appear to review what was covered last year. In fact, while many of the same topics and parts of speech are emphasized, the discussion is much more in depth. In Traditional Catholic Speller 6, the students will learn to spell hundreds of new words, including Catholic terms, with their meanings. Science: This year Science & Living in God’s World 6 covers the universe (specifically, the stars, our sun, our solar system, man in space, origin of the universe, etc. ); basic chemistry (measurements, matter, elements, atoms, chemical laws, molecules, etc. ); and basic physics (machines, energy, sound waves, light, aerodynamics, etc.) While many of these topics have been covered in previous years, the students will find that the complexity increase with each succeeding year, with specific concepts being explored more in depth. A quiz booklet is used to help impress the knowledge into the students’ memory. History: The study of Our Old World Background, starts with early civilizations, travels through the Greek and Roman Empires, to the years of early exploration, and ends with the Protestant Reformation. The students will learn about some of the glories of the Catholic Church, its heartaches and setbacks, and its glorious martyrs and faithful defenders of the Faith. A test book on the course material will be used in conjunction with the text. Handwriting: As students will have mastered their penmanship by this point, Catholic Writing Skills 6 finishes the OLVS course in cursive handwriting. This year’s studies will encourage the students to fine-tune their skills in applying concepts at greater depth. Students will further be encouraged to develop good study habits as the course content becomes more complex. We will also begin preparing the students to enter the adult world as productive members of their community, willing and able to apply traditional Catholic ideals to their daily lives. Religion: Grade 7 continues the Living My Religion series with Living for Triumph. Students will learn about the manifold graces that will come to them as members of the Mystical Body of Christ. There will also be a more thorough study of Bible History, along with daily readings from the Douay-Rheims New Testament. Arithmetic: In Saxon 87, basic mathematical concepts and skills are reviewed and reinforced. Students will study fractions, decimals, percentages, and ratios; delve more deeply into perimeter, circumference, area, and volume; and receive a solid grounding in exponents, scientific notation, and signed numbers. Students continually practice problem-solving techniques through word problems. Literature: In Grade 7 the student will read selections from the first half of Catholic National Reader 6,to continue their exposure to classic English essays, literature and poetry. Saints’ lives to supplement the course include Stories of Don Bosco and Flame of White, a biographical novel of Pope St. Pius X. The Gauntlet is also included to give the student a taste of life in the Middle Ages. History: This year’s history course, Our Pioneers & Patriots by Msgr. Furlong, recounts the founding of our nation, beginning with the problems between the Colonies and “Mother England.” It also thoroughly explores the Catholic roots of our country. The time period covered runs from the French and Indian War (mid-18th Century) to World War IL Advanced 7th Graders may find the text’s reading level not particularly challenging, but it is very beneficial in helping students better understand the foundations of our nation, and chapter exercises will reinforce the facts learned. Students will also enjoy reading Across Five Aprils, a bittersweet historical novel about one family’s trials during the Civil War. Science: This year Science & Living in God’s World 7 will cover the Scientific Way; anatomy and physiology; the Linnaean classification system, along with the study of plants; the sun and energy; astronomy, cartography, and time; and a study of matter. Experiments are assigned and students are guided to record their data in a log book. A quiz booklet is used to help students retain the information. This year’s studies will develop all the students’ cognitive and affective skills learned up to this point. They will be encouraged to apply principles, concepts, and ideals in a much wider field of study than previously encountered. Even more so than in Grade 7, students will be prepared in earnest to enter the adult world as productive members of their community, able to steadfastly defend their Faith. Religion: Grade 8 concludes the Living My Religion series with Living for Holiness. Students will also be assigned readings from the spiritual classic, My Imitation of Christ. Arithmetic: This year students will use Saxon Algebra ½ . The text is designed to render second nature the use of fractions, mixed numbers, and decimals. The concepts of area, percent, ratio and order of operations are discussed at a much more in-depth level than in any previous year. The beginning concepts of algebra are practiced thoroughly as well. Grammar: The Lepanto Grammar series will be completed this year with Lepanto Grammar 8 and its accompanying workbook. Complex grammatical concepts will be examined in much more detail. As in all previous years, the student will learn to spell hundreds of new words, including Catholic terms, with their meanings through Traditional Catholic Speller 8. Literature: As the OLVS program continues to encourage good reading, the student will finish the stories and poems in Catholic National Reader 6, as well as explore several historical novels: Men of Iron presents chivalry and knighthood in Fourteenth Century England; A Tale of the Wars of the Roses teaches perseverance against the backdrop of Fifteenth Century England; Outlaws of Ravenhurst shows how even children can stand strong for their faith in Seventeenth Century Scotland. History: This introduction to world history through The Old World & America will give a thorough understanding of the Catholic roots of Western Civilization. Beginning with the Fall of Adam and Eve, the course covers ancient times, the Greek and Roman world, the coming of Christ, the founding of the Catholic Church, the Middle Ages, Renaissance, Protestant Revolt, and the exploration and colonization of the New World. Christ and the saints are presented as historical figures, bringing alive the Church’s impact on society and culture. Science: Capping the OLVS middle school science program is Science & Living in God’s World 8 with its accompanying quiz booklet. This year’s topics are arranged to afford the students a good grounding before advancing to high school science. Specifically, the text features introductions to many topics which will be developed in high school science, including the Animal Kingdom; human physiology and anatomy, emphasizing the respiratory and nervous systems; energy in its many forms; machines and the work they do. This year’s study will introduce students to the more complex concepts of secondary school, and to the task of applying principles, concepts, and ideals in new fields of study. Students will be obliged to develop good study habits to help in the intellectual digestion of challenging subject matter. Students will continue to prepare to enter the world as productive members of their community, ready and able to defend their Faith and apply traditional Catholic principles to their everyday lives. Theology: This year students will study Book One of the Quest for Happiness Series, Our Goal & Our Guides. This first volume accents faith and the Divine Love that Jed God the Father to create us and promise a Redeemer. Mathematics: In the standard OLVS program Saxon Algebra I covers evaluation of expressions involving signed numbers, exponents and roots, properties of real numbers, absolute value and equations. Integrated into the text are extensive Geometric concepts as well. Some Grade 9 students may already have completed Algebra I or be obliged to complete Algebra I, depending on their previous schooling. Literature: This year the students will be concentrating on perfecting their skills at analyzing literature by identifying and commenting upon the literary elements of character, setting, plot and theme. Students will read The Scarlet Pimpernel, by Baroness Orczy, and learn the horrors of the French Revolution, as well as the nobility of the English in helping French aristocrats escape death. Fabiola, by Cardinal Wiseman, brings to life the saints and Christian persecutions in Rome. Come Rack! Come Rope! by Robert Hugh Benson, presents the Protestant Reformation and the dangers inherent in the valiant Catholic resistance under Elizabeth I.Kidnapped, by Robert Louis Stevenson, explores Scottish history with David Balfour, as he survives attempted murder, kidnap and shipwreck in the company of Alan Breck. The Story of the Other Wise Man, by Henry van Dyke, is the tale of an imagined fourth Magi, whose great desire to see the Messiah becomes the one purpose of his life. History: Continuing the students’ exploration of world history, they delve into the historical progress of the Catholic Church through The Story of the Church. Accompanying the text is a workbook which helps review the concepts and facts covered in the course. Science: The OLVS general science course covers Exploring Creation with Physical Science, by Dr. Jay Wile. Written specifically for the homeschool use, the experiments use common, readily available materials, and the author walks the students through each of the Jabs in a logical easy-to-follow manner. Topics covered include: the atmosphere and weather; the structure of the earth; an introduction to physics, touching on motion, Newton’s Laws, gravity, and astrophysics. This course will help students understand how the entire universe, from atoms to galaxies, is governed and maintained by the infinite power of God. Exploring Creation with Physical Science Solutions and Tests contains, answers to the Study Guide found at the end of each module in the text, tests for each module, and test answer keys. This year’s studies will continue to expand the scope of knowledge for OLVS students. They will also begin implementing ways in which to discover God’s plan for each of them in their personal lives. Theology: This year students move to the second book of the Quest for Happiness series, Through Christ Our Lord, studying the Gospels and their accounts of the life of Christ. Further, the course will delve into the Mass and the Eucharist, with an overview of ethics, as well as an examination of the third and fourth commandments. Mathematics: In the standard OLVS program Saxon Algebra II covers graphical solutions to simultaneous equations, scientific notation, radicals, roots of quadratic equations, properties of real numbers, inequalities and systems of inequalities, logarithms and antilogarithms, exponential equations, basic trigonometric functions, algebra of polynomials, vectors, polar and rectangular coordinate systems. As with all Saxon math courses, geometry is integrated throughout the program. Saxon Publishers assert that any student who has successfully completed Saxon Algebra II has the necessary knowledge for the SAT and ACT. Students transferring to OLV or on a different math track may take either higher or lower levels of math, depending on their needs and aptitude. Grammar: From captivating introductions to compelling descriptions and convincing conclusions, The Elegant Essay walks students through the entire essay-writing process. With explanation and practice exercises, it is an excellent extension and refinement of the students’ writing skills. Easy Grammar Ultimate Series reviews high school English grammar in an efficient program featuring 180 lessons of 10 minutes each. Traditional Catholic Speller 10 covers hundreds of new words and definitions, including Catholic terms. Literature: Grade 10 literature offers several selections of historical fiction from different eras and countries. By What Authority, by Robert Hugh Benson, traces the story of two families, one Catholic and one Protestant, during the English Reformation. The Lances of Lynwood, by Charlotte Yonge, follows the young knight, Eustace, through various adventures which challenge and confirm his knightly virtues. The Red Badge of Courage, by Stephen Crane, is an American classic, which presents a terrifyingly realistic portrait of actual combat in the Civil War. The Ballad of the White Horse is an epic poem by G. K. Chesterton about the idealized exploits of the Saxon King Alfred the Great, viewed as a legendary hero of both England and the Church. History: This survey of American history centers on Christ and the Americas by Anne Carroll. Students will learn about the Catholic roots of our country, meet great Catholics of North and South America, and learn how the Church has fared in the western hemisphere. The history of the United States deftly intertwines with that of other countries, to show the various dynamics which entered into the establishment and growth of nations in the New World. Supplementing the textbook is Catholics of the Confederacy, which explains the role which Catholicism played in the American Civil War. Science: The OLVS biology course covers Dr. Jay Wile’s Exploring Creation with Biology. Using a common-sense Christian approach, he introduces the student to both botany and zoology. The text deals insightfully with the difference between macro-evolution and micro-evolution, and shows why Darwinian macro-evolution is simply not possible. Exploring Creation with Biology Solutions and Tests contains, answers to the Study Guide found at the end of each module in the text, tests for each module, and test answer keys. This year’s studies will train students to use their academic skills in not only discovering, but embarking upon the vocation which God has pre-ordained for them. Students will come to understand how their abilities and skills can be focused on the task of discovering God’s plan for each of them. Theology: This year students continue with the third book of the Quest for Happiness series, The Ark and the Dove. The course reveals the charity of the Holy Ghost, as the students reflect upon the Third Person of the Trinity, as well as the nature, origin, structure and history of the Church. Also discussed are the sacrament of Penance, and the fifth, sixth, and ninth commandments. Mathematics: In the standard OLVS program students study the first half of Saxon Advanced Math (the second half is optional for 12″‘ grade), covering advanced algebra, geometry, trigonometry, discrete mathematics, and mathematical analysis. A rigorous treatment of Euclidean geometry is presented, as well. Transfer students may be on a different math track, in which case they may need a lower level of math study this year. Grammar: To prepare for college, all students are required to study public speaking through the Basic Speech Experiences textbook. The course hones students’ abilities in verbal presentation, thus enabling them to produce oral arguments for the Faith. It also prepares them to compete for jobs and interact with new acquaintances, both professional and social. Paired with the course is a book on political communication, Slightly to the Right, which prepares students for controversial discussions. Traditional Catholic Speller 11 will teach hundreds of new words and their meanings, including Catholic terms. Literature: Grade 11 features three literary classics. First students read Great Expectations by Charles Dickens. The novel depicts Pip’s education and development through adversity as he discovers the true nature of his expectations. Next comes Silas Marner by George Eliot, which paints a clear portrait of social classes in Victorian England, as well as the redemptive power of love. During the last semester, students read the Divine Comedy from Mark Musa’s translation for The Portable Dante. The student will follow Dante on his journey through the afterlife, encountering philosophy, theology, history, as well as a timeless story of the soul’s struggle for salvation and reconciliation with God. History: This year’s course is entitled, “The Free World vs. Communism.” It surveys the antagonism between East and West during the 20th Century. Notwithstanding the collapse of the Soviet Union, students must learn that millions of people are still enslaved by Communism in Asia, Africa and Latin America. This course imparts to students important information about what modem forces have threatened human and God-given freedoms. The Catholic Church, and many patriots, have warned us of the threat of communism. We will learn of that threat by studying The Naked Communist, by a former F.B.I. agent, and School of Darkness, by a former Communist. Other books include the Encyclical of Pope Pius XI on Atheistic Communism, With God in Russia, and 1917: Red Banners White Mantle. Science: The OLVS chemistry course covers Dr. Jay Wile’s Discovering Design with Chemistry. As a Christian scientist whose area of expertise is nuclear chemistry, Dr. Wile introduces the students to general concepts of measurements and units, as well as reviews of energy, heat, and temperature. Then he delves into atoms, molecules, matter classification and changes, stoichiometry, atomic and molecular structure, and numerous other fascinating topics. Labs are thoughtfully designed, and often use nothing more than household materials or items that can be found readily at a pharmacy. Discovering Design with Chemistry Solutions and Tests contains, answers to the Study Guide found at the end of each module in the text, tests for each module, and test answer keys. This year’s studies complete the secondary education of students, most evident in their pre­ disposition to gauge everything by the litmus test of Catholic principles. Emphasis will be placed on the use of their intellectual skills in discovering and embarking upon their ordained vocation. Theology: This year students conclude the Quest for Happiness series with Toward the Eternal Commencement. The textbook discusses the Four Last Things, the sacraments of Extreme Unction, Holy Orders, and Matrimony, and the Apocalypse. The life of the Blessed Mother fits here most admirably as she presents a perfect model for Catholic life. The text also helps seniors discover their vocation in life with Our Lord’s illumination, and prepare to defend their faith in college and work after high school. Philosophy: Students may substitute apologetics for the final year of the Quest for Happiness if desired. The Apologetics textbook and accompanying study guide is a philosophic defense and explanation of the Catholic Religion, presenting a clear and logical explanation for its major tenets. Students who complete this course will be prepared not only to defend the Faith, but also to explain it to good-willed individuals who desire more information. Since Apologetics is a verbal or oral discipline, students will be occasionally required to record assignments for tutor review. Grammar: This year, students will study the Research Paper which teaches them the step-by-step process of writing term papers in MLA style. The Catholic Book of Character and Success will teach students how to use criticism prudently, how to discipline the imagination, and how to tell the difference between pleasure and happiness. Traditional Catholic Speller 12 will cover hundreds of words and their meanings, including many words of exclusively Catholic or ecclesiastical significance. Mathematics: The second half of Saxon Advanced Mathematics is optional for most students, but especially encouraged for those who intend to apply to college. Topics include parabolas, binomial expansions, trigonometric identities, logarithms, exponential equations, equations of the hyperbola and ellipse, convergent geometric series, matrix addition and multiplications, graphing of factored polynomial functions, inverse matrices, use of the graphing calculator, and much more. Literature: Grade 12 covers four works of literature, beginning with Initiation by Robert Hugh Benson, the beautiful story of a modem Englishman’s conversion. Ivanhoe, by Sir Walter Scott, is the story of the titular hero who returns to England after the crusades to face any number of trials and tribulations for the sake of home, true love and Faith. The Virginian, by Owen Wister, is a classic which did much to build the romantic myth of the heroic cowboy in the American consciousness. Finally, returning to one of the great works of English literature, the student will study Seamus Heaney’s translation of Beowulf, the epic poem in which the hero encounters monsters, and overcomes them for the sake of following the high path of heroic virtue until death. Civics: To become good citizens, students must learn the basic functions of government. In addition, as Catholics, they must understand their relationship to authority and duty to society. They should further comprehend the Church’s position on exercise of government. In order to accomplish these intellectual goals, OLVS has updated a Catholic civics textbook entitled Christian Citizenship. It will be studied in conjunction with Michael Davies’ booklet, The Reign of Christ the King, The Measuring Tape, by Frank Denke, and Catholic Action for Christ the King. Science: Throughout elementary science, the students received small portions of information pertaining to health and the human body. If they wish to look at the topic more closely, OLVS offers an optional health science course which gives an overview of anatomy and physiology in Review Text in Health, as well as nutrition in Teenager and Nutrition, and basic First Aid information in First Aid Participants’ Manual. One of the following courses may be used as a substitute for a comparable course in our regular curriculum. For instance, the General Math course may be substituted for an Algebra course. A language may be taken in addition to the other subjects. However, if one of the courses is taken in addition to the original six subjects, there is an extra fee of $75.00 which covers cost of tuition and lesson plans. Lesson plans for individual subjects may be purchased for $25.00. Consumer Math: This course uses Consumer Math. This book is illustrated throughout with graphs, charts, relevant exercises, and solutions. Topics covered include earning money, managing a household, buying and maintaining a car, budgeting your money, banking, investing, and paying taxes. Geometry: Saxon Geometry is the perfect solution for students and parents who prefer a dedicated geometry course…yet want Saxon’s proven methods! Presented in the familiar Saxon approach of incremental development and continual review, topics are continually kept fresh in students’ minds. Covering triangle congruence, postulates and theorems, surface area and volume, two-column proofs, vector addition, and slopes and equations of lines, Saxon features all the topics covered in a standard high school geometry course. Two-tone illustrations help students really “see” the geometric concepts, while sidebars provide additional notes, hints, and topics to think about. Other books used: Saxon Geometry Test Booklet and Saxon Geometry Solutions Manual. Saxon Teacher CD is also available. Latin I, II & III: Our Lady of Victory has divided the Henle Latin First Year textbook into two courses – Latin I and Latin II. Latin III is actually the entire Henle Latin Second Year textbook. The goals of linguistic training are to be attained through mastery of the language itself, and through the study of selected classics. The dominating objective of First Year Latin is a thorough mastery of forms, basic syntax, and vocabulary, as well as ability to read and translate simple sentences. 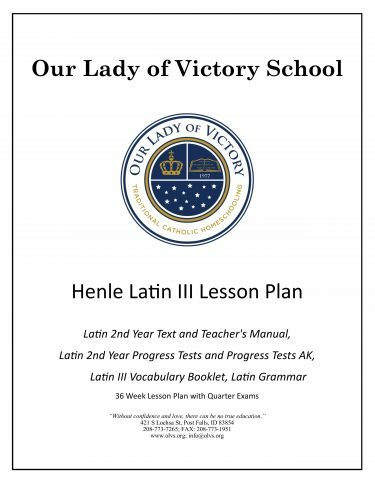 See Latin (on the Bookstore page) for Introductory Latin Materials for lower grades. Advanced Literature: This course is recommended for the literature student interested in an in-depth, full year course of study on two works by William Shakespeare: Henry V and Macbeth. Ancient Literature: This Literature course is designed to acquaint and familiarize the student with classic and enduring literature from ancient authors of Western Civilization, including mythology and the great epics of Homer and Virgil. Two Shakespearean plays are included that are more current (less than 450 years old), but which have been derived from Ancient sources – either literary, mythological or historical. Literature – English Classics Series (Critical Editions): Click here to see the four books in this course. Philosophy: This course will be an in-depth introduction to Apologetics. This course is a philosophic defense and explanation of the Catholic Religion, presenting a clear and logical statement of the reason behind the Catholic Religion. Every Catholic has a duty to investigate the reasonableness of his religion and to be prepared to explain it to non-Catholics. The students who successfully complete this course will be sufficiently prepared not only to defend his Faith, but also to explain it to those good-willed individuals who truly desire more information. In order to train our students to argue logically and persuasively, and to answer common questions proposed by Catholics and non-Catholics alike, we use both Apologetics Text by Monsignor Glenn, and the accompanying Apologetics Study Guide (Take Off Your Shoes). Since Apologetics is a verbal or oral discipline, students will be occasionally required to make tapes of assignments for OLVS tutor review. Physics: This college-prep physics course is designed for the student who has completed algebra and has had an introduction to the definitions of sine, cosine, and tangent. It provides a detailed introduction to the methods and concepts of general physics, heavily emphasizing vector analysis; this text is ideal preparation for a university-level physics course. It provides the student with a strong background in one-dimensional and two-dimensional motion, Newton’s laws and their application, gravity, work and energy, momentum, periodic motion, waves, optics, electrostatics, electrodynamics, electrical circuits, and magnetism. Typing: The student will learn to type using the Mavis Beacon Teaches Typing method. You will need a computer that has a CD disk drive. The program will guide you, giving accuracy, typing speed, number of errors and adjusted typing speed. Students in grades 9 – 12 should be encouraged to use their new typing ability in doing their assignments once their ability reaches a reasonable proficiency. We were there for your grandparents, and we will be here for your grandchildren. Full enrollment for international students involves the same process as students from the U.S. and includes the same services such as: record keeping, issuing quarterly progress reports, report cards, tutor support, academic counselor support, and lesson plans. 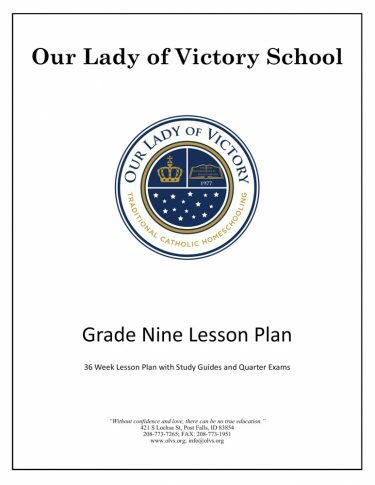 Our lesson plans detail a 36 week school year. Diplomas issued for eighth and twelfth grade graduates. * International families may submit their work online if possible. The International Work Return Fee does not apply to families who choose this option.